The 1,000-tonne heavy and five storeys tall two-megawatt turbine has been successfully connected to the power grid in Nova Scotia and now is providing energy to hundreds of homes. It has a subsea gravity base that allows it to sit on the sea floor under its own weight at the eastern end of the bay in the Minas Passage, a five-kilometre-wide channel near Parrsboro, N.S. The demonstration open-centre turbine, designed and manufactured by OpenHydro, uses a fraction of the estimated 7,000 megawatt potential of the Minas Passage. 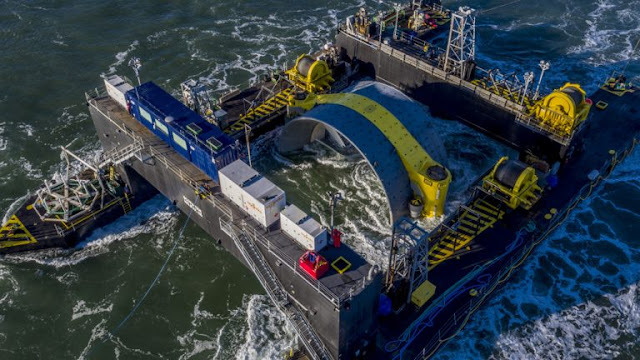 A second turbine, planned for deployment in 2017, will make Cape Sharp Tidal project one of the largest tidal generating sites in the world. The completed four-megawatt project will replace the need to burn 2,000 tonnes of coal, and eliminate 6,000 tonnes of greenhouse gas emissions. That’s the equivalent of taking 1,000 cars off the road each year. The tidal energy industry in Nova Scotia has the potential to create up to 22,000 jobs and contribute as much $1.7 billion to the economy, according to Nova Scotia/s Energy Minister. Three hundred Nova Scotian companies are involved in the supply chain so far.